Today students began class with a BrainPop on currents and took the quiz. Tim and Moby did an excellent job describing how currents affect global weather patterns. 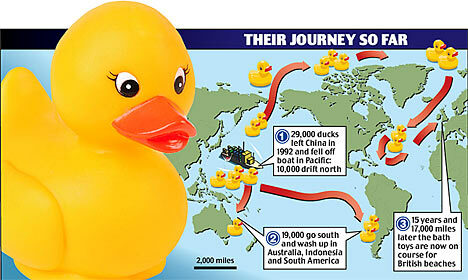 They also explained global water circulation in the global conveyor belt. Students also did a reading about this global water movement. Click on the photo for a better view. Global water movement is important for oxygen and nutrient distribution, but also has major impacts on migration of animals and weather patterns. Today in class we discussed water temperature and upwelling. For notes we continued talking about water movement and addressed ocean temperature and location. Areas near the equator are considered tropical, but do not always have warm water. The same is true for temperate areas between 30 and 60* latitude. Water at the poles is always cold though. Upwelling is when cold nutrient-rich water comes up to the surface. It is fed by deepwater currents hitting land and rising to the surface. These areas have cold water that is full of nutrients, so there is heaps of plankton, and as a result lots of fish and other marine life. There are two known upwelling spots in California on either side of Monterrey Bay, shown in blue and purple on the map. There are elephant seal and sea lion rookeries (hang outs) at both of these spots because there is plenty of food for the seals and sea lions and their babies to eat. Today students learned about light in the ocean and how far light travels down. The amount of light transmitted depends on the turbidity (clarity) of the water. 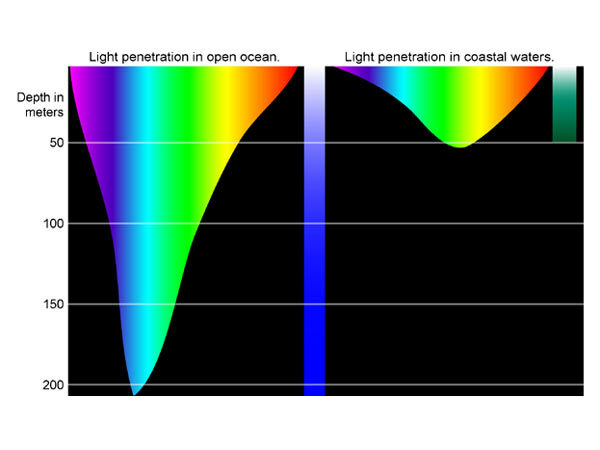 Different colors of light travel different lengths. Blue travels the farthest, but red, orange and yellow do not travel far. Because red does not travel far, these organisms appear black. After discussing bioluminescence (organisms that can produce their own light) we looked at brief video clip about it that is a little old and then a TED talk by David Gallo that is more recent. Gallo's talk showed the organisms in more accurate color and in motion. His talk also showed some amazing footage of cephalopods like cuttlefish and octopus performing magical feats of mimicry and camouflage. You should definitely follow the link and watch this video stream. His talk was based on research by Dr. Widder. We looked at some of her photos and you can learn more about her work and see her presentation here. 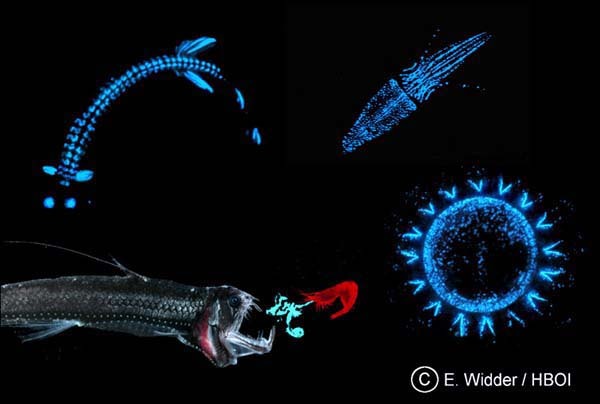 When it comes to deep sea creatures - some bioluminesce and some don't. People are fascinated with the gulper eel, a four foot long eel that has a HUGE jaw. It has such a big mouth so that it can eat anything it comes in contact with because in the deep ocean, meals may be far and few between. More information about the gulper eel and other deep sea creatures can be found at Sea & Sky's Website. 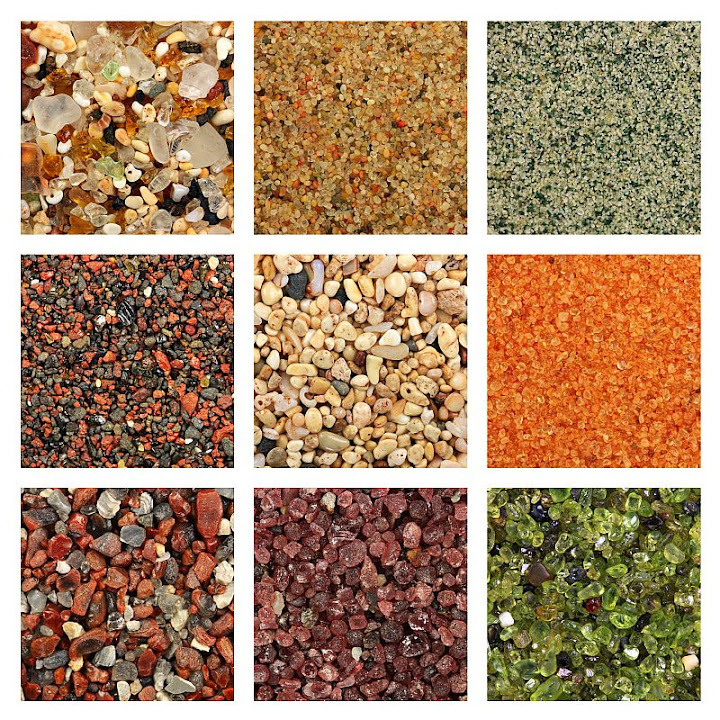 We discussed sand and where it comes from, what its made of, what colors it can be, an how shape and size affect the texture. We watched this video as an introduction. 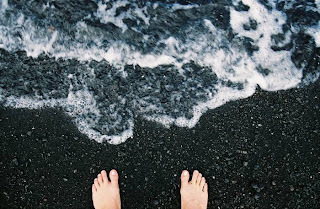 In Hawaii there are black, red, and green sand beaches that have been deposited from the weathering and erosion of volcanic rocks. In the Caribbean, you can visit white and pink sand beaches from the weathering and erosion of sand and coral. Students used scopes and made observations of sand samples from Hawaii, Grand Cayman, Normandy France, Lake Anna, Lake Superior, California, and Virginia Beach. 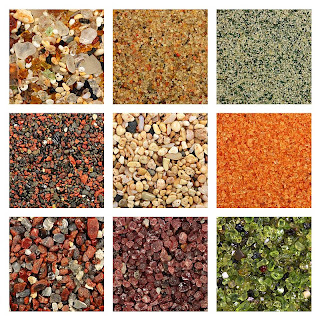 Students determined what the sand was made of, where it came from, how old it was, if it was on an active beach, a windy beach - all kinds of information can be collected from a simple sample of sand! 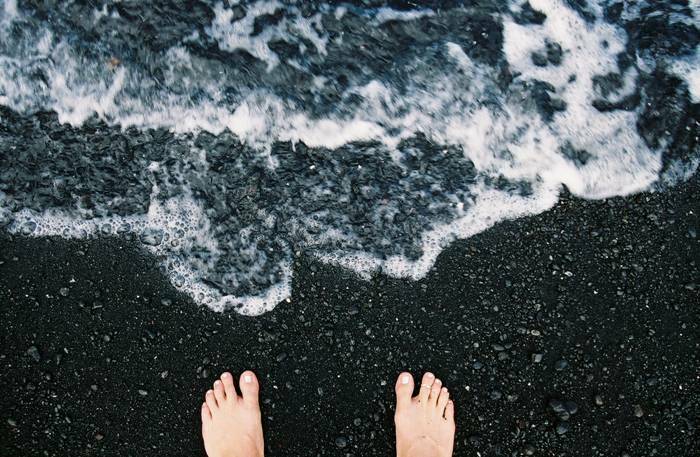 Here are MsJ's toes on a black sand beach in Hawaii! Today the class was spent working independently on the seafloor features surrounding the United States and reading and answering questions about underwater vehicles. Submarines are larger than submersibles and carry more people and can go longer distances. ROVs and AUVs are robots like remote-controlled cars, but go underwater. ROV's have a tether (cord) connecting them to power and AUVs do not. Students started class by going over safety rules and procedures with a pictorial challenge. Afterwards students took the safety test. Today in class we discussed waves, powered by wind, and their parts. We also discussed tsunamis, which fascinate most students. Tsunamis are caused by underwater earthquakes and they displace water. Displacement of water causes a large wave or energy to travel through the water, but it cannot be seen at the surface until the wave approaches shallow water. (Confused? Check out the diagram to the left) Because the wave is not felt in deep water, going out to sea is one option for escaping a tsunami, getting onto land with higher elevation is another option. There are places in Japan and Hawaii where fishermen went out to sea in the morning and when they returned, their villages had been washed away. gravitational pull on the ocean. The sun has an impact too, but the moon's impact is greater because it is a lot closer. The ocean water bulges towards the moon and causes the high tide... areas perpendicular to the bulge are having a low tide. 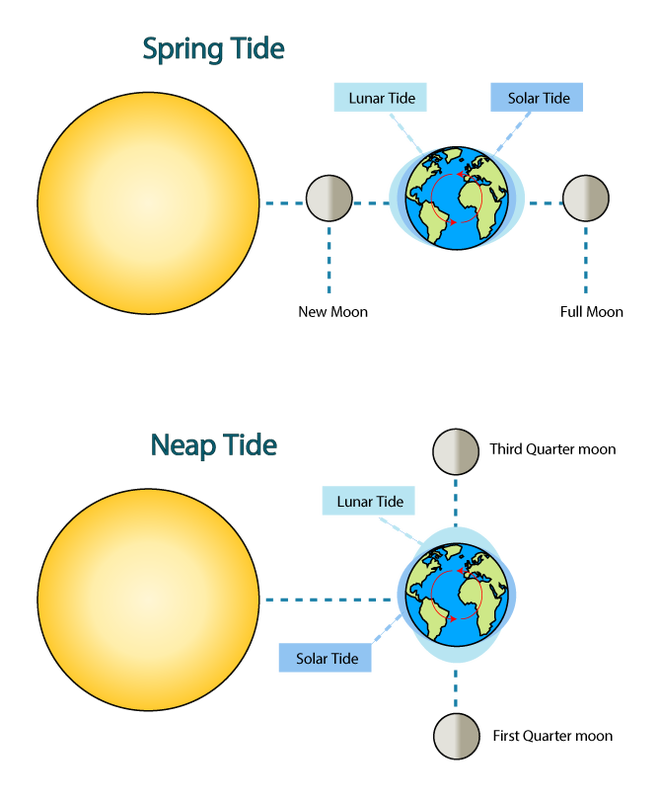 Because the earth is rotating, each place is going to have two high tides and two low tides each day.Spring high tides are exceptionally high and really really low when the earth, sun, and moon are all lined up in a row. We finished class by discussing temperature and locations on the globe and watched some Blue Planet on tides, tidal bores, sand bubbler crabs that comb through sand eating macro-organisms, and bears that eat clams. Almost ninety percent of plastic bottles are not recycled and quite a lot of them end up blowing and floating around the environment where they look gross but also pose a hazard to wildlife. Most students do not think about where their garbage ends up. If you'd like to see the presentation - click here. For more information about plastics in the ocean - check out this info from the Ocean Conservancy. Many people mistakenly think that the sea floor is flat. Well about 80% of it is called the abyssal plain and is relatively flat, but the sea floor has mountains and canyons just like the land we see everyday! We discussed the definitions and identified them on maps and then answered some questions. Test yourself - can you identify the features to the right? Currents can be identified by their temperature, salinity, and density. Students identified which currents were warm and cold by looking at where they are coming from and then colored them appropriately. Sailors have known about some of these currents for a very long time. Early explorers knew it took less time to go to Europe from North America and not the other way, even if they didn't know it was the slightly warmer, slightly faster Gulf Stream that was carrying them along. Scientists who study currents have historically dropped stuff into the ocean and recorded where it has turned up. Yes, those messages in a bottle can be useful. Students practiced latitude and longitude by plotting some points of a cargo lost overboard and where some of the shipment washed up beaches, then they read articles and answered questions, and finished up by listening to a podcast interviewing Curtis Ebbesmeyer, the oceanographer who studies sneakers, rubber ducks, and other floating debris. You can listen to the podcast here. 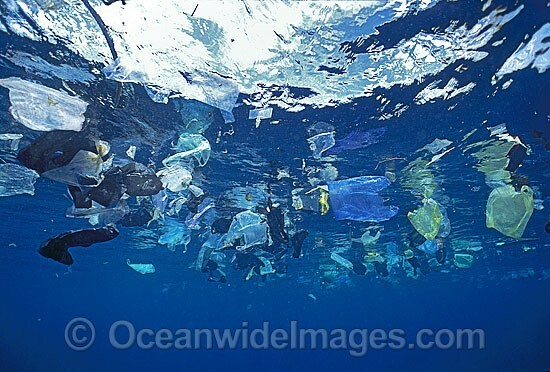 In the interview, and in the readings, gyres full of floating plastic debris are discussed. Here is a map showing some of the locations of these gyres. Click on the picture to get a larger view. Here is an excellent website with more information and some nifty graphics. We will continue to discuss this in class. You are in the computer lab to do work for this class. If you are not doing work, then we will have problems. Do not pack up early. Work until the bell or until MsJ says. SAVE OFTEN. And if you save to a key, also save it to your number. If you lose it, you will have to do it again. If MsJ asks for your attention, stop what you are doing and listen to what she has to say. You may watch videos about your organism through reliable websites. You may listen to music through the computer if you have your own headphones. Rule1 MsJ cannot hear it. You get one warning. Rule2 Turn it on and listen – no million clicks and constant changing. Take both ear phones out when MsJ is talking. Welcome to MsJ's Marine Ecology Blog. This blog is for parents and students to see what we are doing in class and for information on projects. The Greatest Predator in the Ocean! 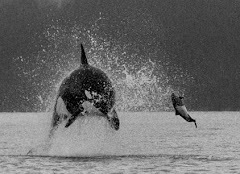 Orcas are very smart hunters. They hunt in packs to take down large prey like baby whales, sneak up on unsuspecting seals on the beach, and have been known to tip ice bergs to get at more seals. 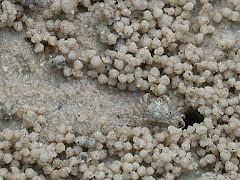 Sand Bubbler Crabs sift through sand grains to eat tiny animals between the grains. Click the photo to see "how this works." What is Ms J's other class doing? The slipper snail looks like a slipper if you turn it over and stick your toes under the covering. Slipper snails are also sometimes referred to as the Devil's toenails. Sea cucumbers are echinoderms with a round oblong body shape. They are important detritus feeders. To learn more, watch the video. Open the links below in a new tab and play "Scatter" or "Space Race" with BOTH sets. Please do not spend more than five minutes on each (ten minutes total). Please read all of today's goals from start to finish. If you have been absent all projects are HERE. The Fish Builder is MARE Build a Fish. The Shark Interactive is HERE. I'm done! If you are done, please be helpful to others by proofreading and staying quiet. Play free-rice (a MsJ fav). Be a citizen scientist and help out Snapshot Serengeti (a fav of mine), Seafloor Explorer, watch worms, analyze cancer, and others! If you have an upcoming SOL do some practice questions. You may work on items for another class or do something science related. You may not shop, watch random videos, or play non-science games. Really Swell Resources - Ask MsJ if you need help finding information.